Of all the new Open Graph apps launched tonight, Ticketmaster’s new Facebook experience is the most impressive. Sure it can share that you’ve “bought” tickets, but lots of apps have similar publishing functionality. What makes Ticketmaster’s app cool is that it pulls your Facebook profile’s music app activity from services such as Spotify or Rdio, and recommends nearby concerts of artists you actually listen to, not just those you say you Like. Ticketmaster has come a long way in the two years since Nathan Hubbard became CEO following its merger with LiveNation. It now shows you its service fees up front rather than tacking them on as you checkout. This pissed off artists and venues who thought it would scare away sales, but Ticketmaster did it in the name of transparency. Executive VP of ecommerce Kip Levin tells me that for a long time the company was scapegoat for all of the live event industry’s problems. Now it’s pushing back and putting the customers first — something people might not expect just because it charges those pesky service fees. 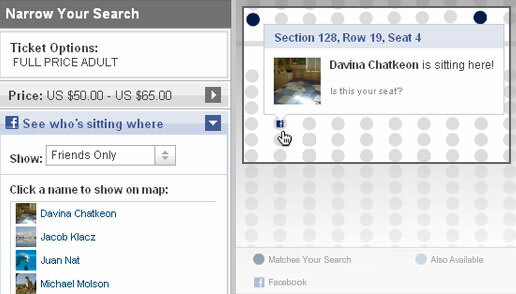 In August Ticketmaster began allowing you to tag the seats your purchase with your Facebook profile. That way friends who are deciding what seats to buy can see where yours are select ones close to you. People are a lot more willing to buy a single ticket to an assigned seat show if they can sit next to their friends. This is one example of how optimizing for the customer experience can also benefit the company’s bottom line. Ticketmaster’s new canvas app brings the entire event discovery and ticket purchase flow within Facebook. You’re shown a feed of concerts your friends have RSVP’d to or shared that they’ve bought tickets to, followed by personal recommendations. Thanks to Facebook data permissions, it can suggest nearby events based on your Likes and listening activity without having to ask your preferences. Several competitors launched Facebook Open Graph ticketing apps including Ticketfly, but none provide listening-based recommendations or interactive seat maps. Many web services that release Facebook apps primarily use the social network as a distribution and marketing channel. The best ones, like Ticketmaster, request your personal data and responsibly apply it make their products better. It’s already working. I was just suggested an upcoming show by one of my favorite bands Neon Indian, who I listen to a lot but never got around to Liking.